The Meadowlark Motel is an iconic motel in the heart of Maggie Valley,right in the center of the Great Smoky Mountain National Park and near the Blue Ridge Parkway.Offering old-fashioned good service and modern amenities including jetted tubs in select rooms and free Wi-Fi, our Maggie Valley motel also features an outdoor pavilion with a full kitchen and a park-like setting on Jonathan Creek. Book a stay at our motel and you’ll be conveniently located near a host of popular things to do. These include The Wheels Through Time Museum, Cataloochee Ski Resort, The Stompin’ Ground, Maggie Valley Festival Grounds (home to Bluegrass jams, auto shows and festivals throughout the year) and much more. 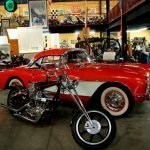 Located at 62 Vintage Lane in Maggie Valley which is right behind our motel, the Wheels Through Time Museum dedicates itself to preserving and displaying the world’s premier collection of rare American motorcycles. You’ll also find memorabilia and a few unique automobiles. Altogether, there are 300 iconic machines on display. Don’t miss the opportunity to kick up your heels doing the renowned Two-Step or Mountain Flatfoot dances at The Stomping Ground in Maggie Valley. Even if you’re not much of a dancer, you’ll enjoy listening to the live band and watching professional dance teams who perform throughout the night, with dance styles from clogging to line dancing and square dancing. Music styles presented by live bands range from old-time fiddling to traditional and contemporary Bluegrass and Country. Usually open only on Saturdays, The Stompin’ Ground offers a unique opportunity to experience authentic Bluegrass and Country music, great food, Appalachian and American group dance at an affordable price. It’s a perfect night out for the whole family. Housed in a barn-style structure, the huge dance floor offers plenty of room to dance if the mood strikes you. Most seating has good views of the dance floor as the building offers stadium-style seating that accommodates nearly 1,000 guests. 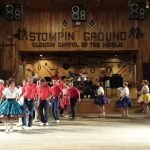 Billed as “the cloggin’ capital of the world,” The Stompin’ Ground is located at 3116 Soco Road, just a short drive from our Maggie Valley motel. This course is about a 5 minute walk from our motel. It is two 18-hole championship courses for lots of family fun! Maggie Valley Carpet Golf has been family Owned And Operated Since 1963. Fun for all ages! 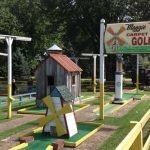 $4 per person for 18-holes of miniature golf. If you’re looking for a group rate, they have a 10 Game ticket for $30 which saves you 25% and never expires! Can be used by one or multiple people! Maggie Valley Festival Grounds – Plan your vacation to coincide with any of a number of yearly festivals, shows and special events held at the Maggie Valley Festival Grounds annually. They offer something in every season for the whole family. It’s just a short drive from our motel on Soco Road (Highway 19). Maggie Valley Club and Golf – Situated at 1819 Country Club Drive in Maggie Valley, this is the place to practice your golf swing during your stay in our beautiful town. Need even more ideas? How about fishing, tubing, hiking, paddling, elk viewing and antiquing – all easily accessible near our charming motel in Maggie Valley. Browse through our website and you’ll find articles on many nearby attractions. Also, check out the Chamber of Commerce website for even more ideas of exciting things to do during your vacation in Maggie Valley and the Great Smoky Mountains National Park.